We have all done crazy things in the service to changes in our lives. Some of us write poetry, while others take up hard drink or gambling. However, only one man that I know of built a person out of wood and burned it in effigy on the beach. That man was Larry Harvey, and his engulfed in flame manner of self-expression was to draw a small crowd of onlookers. It was also to grow into “Burning Man.” The now-massive gathering of self-expression turns 33 years old this year. Gildshire takes this great occasion to see what it was yesterday, what it is today, and what it might be tomorrow. Burning Man operates under a set of core principles, which are understood and lived out by each participant. That’s what makes Burning Man all-inclusive and individual, simultaneously. Anyone may be a part of Burning Man, as it welcomes and respects the stranger. No prerequisites or credentials are necessary. You must buy a ticket, provide for your own basic needs, (a place to sleep, and some sustenance) and follow the simple guidelines for group safety. Gifts are given with no expectation of a quid pro quo. Give as you have, take as you have not. Think of it a kind of potlatch. Attempts to celebrate or participate in commercialization will be strongly resisted. There are no financial transactions at Burning Man, except for certain beverages and ice. Nearby school districts benefit from Burning Man ice commerce. The harsh environment on the playa at Black Rock Desert requires participants to tend to their own subsistence. There isn’t a 7-11 for miles, mercifully. This is where things get fun, or tricky, depending on your perspective. How you express yourself is your business, but you are expected to share it communally and freely. If you are a singer, share your gift with your neighbors. If you’re an artist, paint portraits of your neighbors and express through your art the shifting sands of the desert? Do you like to do these things with your clothes off? Feel free, though most people remain clothed. But you do you. No two Burning Man Festivals are alike, except for dancing. Because, there is always a great deal of dancing. Everyone works and everyone plays. Burning Man believes in a world experienced together. “Observing” isn’t encouraged. Participants join in the effort to co-create Black Rock City, so an observer would stand out. For over three decades, Burning Man has thrived under these six core principles, and four others much like them. However, things have changed in the last few years. Extraordinarily wealthy participants with expensive “glamping” equipment show up annually, and in greater numbers. Things like high-powered A.C. units hum for the comfort of those lucky, and well-heeled enough, to get inside. It’s called plug and play, but the players aren’t plugging into what makes Burning Man great. Wi-fi: Part of Burning Man’s mystique was its away-from-it-all-ness. For years, no one brought cell phones. Then, people brought cell phones, but most of them didn’t work. Now, there is an internet cafe on site, and cell phones have become hugely powerful. Participants are burying their faces in their phone screens and losing their souls’ renewal point as a result. Immediacy isn’t just a goal at Burning Man. Rather, it is a reason to be there. Perhaps, THE reason to be there. There are changes afoot for Burning Man 2019 that are toward solving some of these problems. Known “No Trace Left” violators received “disinvite” notices. 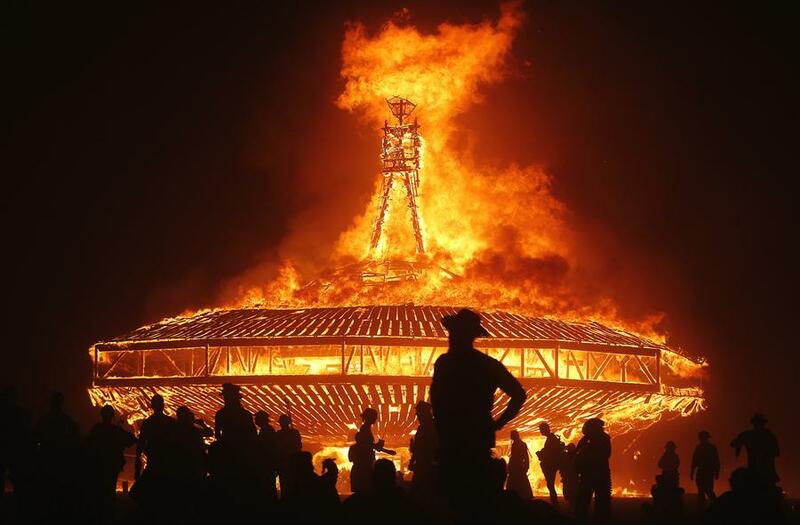 The nonprofit Burning Man Project is taking the steps necessary to keep the principles intact, so the people who appreciate the foundation of Burning Man are able to attend. For sure, Burning Man will survive the changes, but will it remain true to its founding principles? That is the question facing the nonprofit and the attendees. It is a movement worth saving, hopefully with its core principles intact and stronger than ever. Burning Man 2019 will take place August 25 – September 2, in the Black Rock Desert of Nevada.